Catalyzed by the development of new neurobiological and behavioral techniques as well as new conceptual and theoretical approaches to the study of the relationship between brain and behavior, research exploring brain functions enabling learning and memory has greatly accelerated in recent years. 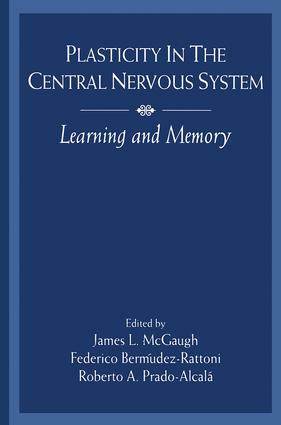 The chapters in this book reflect current theoretical approaches to the study of brain and memory and provide new insights concerning the cellular bases of memory and the differential involvement of brain systems in different forms of memory. By presenting up-to-date summaries of research investigating brain mechanisms underlying learning and memory, these chapters help to place current findings in appropriate theoretical context, and further stimulate research inquiry attempting to understand how the brain makes memory. * an examination of molecular analyses of events associated with memory formation. Contents: Preface. J. Garcia, Brain and Behavior: Bridging the Barranca. J.L. McGaugh, L. Cahill, M.B. Parent, M.H. Mesches, K. Coleman-Mesches, J.A. Salinas, Involvement of the Amygdala in the Regulation of Memory Storage. I. Izquierdo, Role of the Hippocampus, Amygdala and Entorhinal Cortex in Memory Storage and Expression. R.A. Prado-Alcalá, Serial and Parallel Processing During Memory Consolidation. F. Bermúdez-Rattoni, C.E. Ormsby, M.L. Escobar, E. Hernández-Echeagaray, The Role of the Insular Cortex in the Acquisition and Long Lasting Memory for Aversively Motivated Behavior. F.H. Gage, M. Kawaja, K. Eagle, G. Chalmers, J. Ray, L.J. Fisher, Somatic Gene Transfer to the Brain: A Tool to Study the Necessary and Sufficient Structure/Function Requirements for Learning and Memory. J. Bures, Reversible Lesions Reveal Hidden Stages of Learning. R.F. Thompson, J.A. Tracy, Cerebellar Localization of a Memory Trace. H. Eichenbaum, B. Young, M. Bunsey, Persistent Questions About Hippocampal Function in Memory. J.M. Fuster, Frontal Cortex and the Cognitive Support of Behavior. Y. Dudai, K. Rosenblum, N. Meiri, R. Miskin, R. Schul, Correlates of Taste and Taste-Aversion Learning in the Rodent Brain. S.P.R. Rose, Time-Dependent Biochemical and Cellular Processes in Memory Formation.